On January 11 at the Okinawa Industry Support Center in Oroku, Naha City, Representative Director Denichiro Ishimine of OMSB (left) and President Chokei Taira of OCVB signed a comprehensive business alliance on the diving certification system. 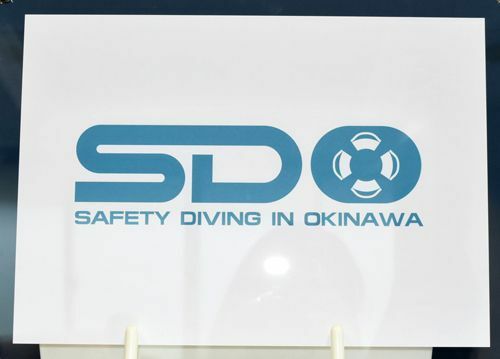 The Okinawa Marine Leisure Safety Bureau (OMSB) will institute its system to certify the excellence of diving companies and guides on April 1. 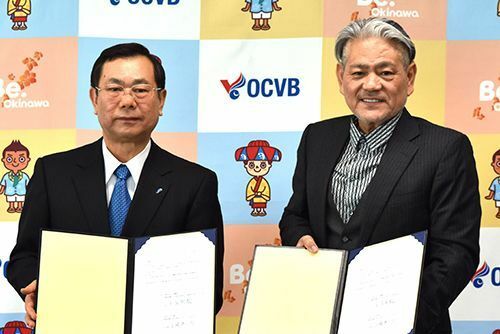 On January 11, OMSB signed a comprehensive business alliance with the Okinawa Tourism Convention Bureau (OCVB) to launch the system. The OCVB will list certified companies on its homepage with the aim of building a safe and trusted Marine Leisure brand. According to OMSB, systems to certify diving ability are rare in Japan. There are more than 900 diving companies in Okinawa, which has created price competition. Because the majority are individual businesses, opportunities for continued education in the latest CPR and rescue methods are limited. There have been complaints about the gap between the services available and the services that consumers expect. OMSB holds seminars once a year to train industry personnel in methods to handle accidents, and certify participating industry personnel and guides as safe and trusted. It awards a certification mark according to ability, and serves as a guide to help customers make selections.